With escalating battery prices it is becoming more and more important to get the most out of your batteries. PulseTech's patented pulse waveform technolgy is proven to reduce and prevent sulfation buildup on lead acid batteries, whether the batteries are in use or in storage. A primary cause of battery failure is the buildup of lead sulfate crystals on the battery plates. Lead sulfate forms as a result of normal battery function, but over time a residue of sulfate will remain on the battery plates and crystallize. This crystallized sulfate is no longer available in the battery electrolyte, and insulates the active battery plate material from the remaining active electrolyte, leading to the eventual 'death' of the battery. PulseTech's unique charging systems create regulated pulses of DC current, which are then fed back through the battery causing sulfate residue to break down and return to the electrolyte solution, boosting battery performance and prolonging functional lifespan. PulseTech's SolarPulse models utilize their unrivaled solar charging system combined with their patented optimized high frequency pulsing circuit to ensure your unused batteries will start when you need them and last up to five times longer. The 6-Watt ERV SolarPulse Charging System provides a full 6-Watts of power in a longer, narrow profile 16''L x 4.93''W x 0.125''H solar panel designed to be installed easily on the light bar of emergency and law enforcement vehicles. The solar panel replaces the power loss from electrical accessories that occurs even when the ignition is switched off and can offset the higher parasitic load these types of vehicles produce. SolarPulse's crystalline silicon cells pack more power per square inch and have a longer life than standard amorphous 'thin film' cells. Since the solar cells are placed directly on low profile aluminum panels instead of needing a bulky metal frame, you can flush mount the solar panel so it has less chance of being accidentally damaged. And finally, SolarPulse's solar panels are protected with a clear polyurethane plastic coating that makes them virtually indestructible and impervious to weather aging and damage from bumps and knocks. That means you can get the power you need in a sturdier, smaller-sized solar panel. To understand how pulse conditioning works, you need to know that batteries ‘wear out’ because the electrolyte inside them slowly crystallizes over time, building up lead sulfite deposits on the battery plates. These deposits effectively insulate the battery plates, making it harder and harder for the battery to create electrical current. Eventually, the battery will not hold enough of a charge to function properly. 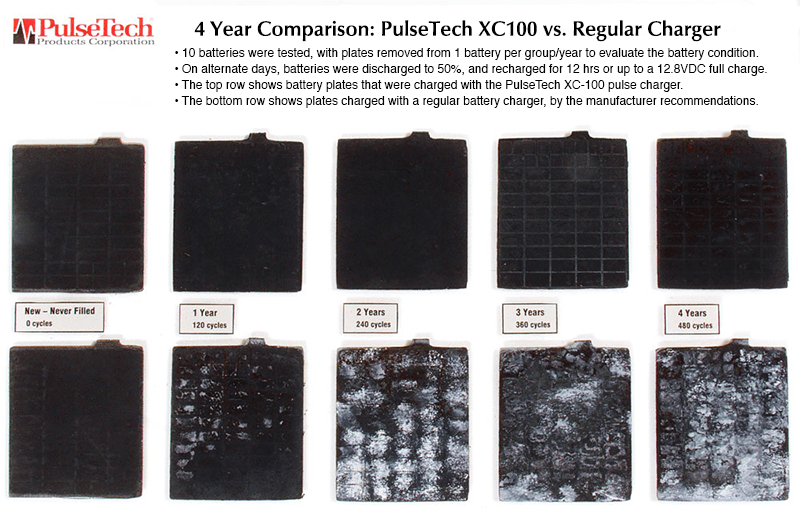 This photo shows the results of a 4-year test conducted by PulseTech, showing how pulse charging technology helps prevent this damaging buildup. After 4 years of every-other day charging/discharging, the PulseTech charged battery plates still look almost new.